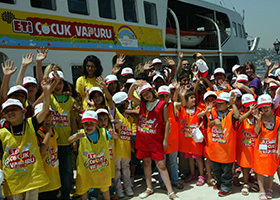 Within the scope of “ETİ Children’s Ferryboat” project that we realized between 2007-2009 with the aim of contributing to the personal development of the children who will be the modern future of Turkey, we took the children between the aged of 7-12 under the protection of Social Services and Child Protection Agency (SHÇEK) to an unforgettable tour of Bosphorus where they participated in workshops such as painting, percussion, history and drama. 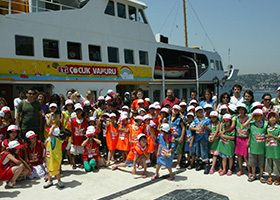 Total 800 children growing up with limited opportunities not only discovered the unique beauty of Bosphorus with ETİ Children’s Ferryboat, but also had the opportunity to develop themselves by participating in educational, teaching and entertaining workshops and gain knowledge that will guide them throughout their lives. 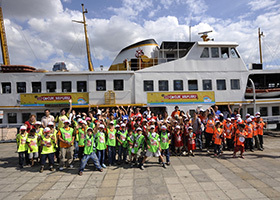 In the first year of ETİ Children’s Ferryboat, the children had the opportunity to listen to the mythological stories about historic sites and the people of the city in which they live. 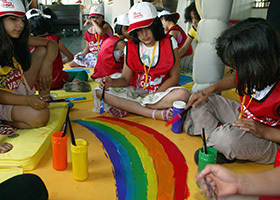 During this time, the children also received painting and percussion training and built self-confidence by creating their own work of art in the workshops. In 2008, history lessons were replaced by drama studies. The play titled “Who will be the Rainbow?” was performed during drama studies in the ferryboat themed “Rainbow”. In the rhythm workshop organized in 2009, the children enjoyed listening to each other and also learnt the value of teamwork. 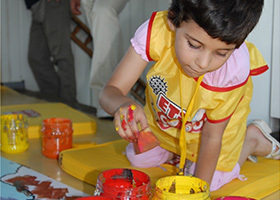 Glass painting, toy sculptures, t-shirt painting, hand puppets and recycled sculpture activities were performed as well as percussion training. 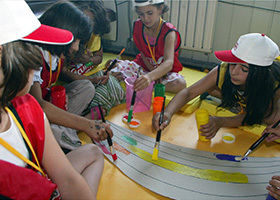 The children depicted themselves as the heroes who saved Istanbul on t-shirts on which their photos were printed. In glass painting activity, the children demonstrated their creativity by picturing Istanbul landscape they observed from the ferryboat. The children had the opportunity to shape the toys of their dreams with newspaper, wire and tape and special colored clay as well as making multicolored puppet designs from colored foam. 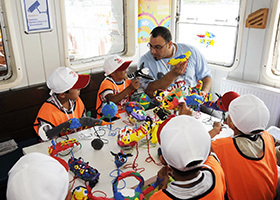 One of the most beneficial activities of ETİ Children’s Ferryboat was the recycled sculpturing activity. The children received training on recycling first, and then they made giant sculptures of sea animals from ETİ packaging and plastic bottles. Various handicrafts created by the children with their own creativity were displayed at shopping centers all around Turkey as part of ETİ Children’s Ferryboat Exhibition.